For when four walls and laminate flooring just won’t quite cut it, here are four types of space that should help foster creativity and innovation in the workplace. Creative agencies seem to have cottoned onto making work spaces conducive to creativity and innovation. Corporate companies, however, are less inclined to make such adjustments, but if you want your employees to sit up, take action and feel inspired throughout their working day, ensure you invite one of these four types of space into your office environment to get the most out of their time. Remember when your teacher used to take your lessons outside to the playground in the summertime? That wasn’t just to treat you to a little sunshine; being outside has actually been proven to boost concentration and creativity. Although you might not be able to move desks outdoors, you can bring a little nature into your working habitat. Think natural looking wood flooring designs, real plant life scattered about the place, windows that actually open and perhaps even a little aquarium? That feeling of freedom and being in touch with nature is likely to boost productivity, tenfold. Nature not your thing? There are many office spaces cropping up with faux trees sprouting within, or tardis’ in the corner of rooms, so why not inject a little spirit into your office and celebrate the uncanny instead? Start with a picnic area instead of a canteen, complete with turf and benches, or perhaps a meeting room decorated in the style of an old school classroom to stimulate the mind. If you don’t feel like going all the way, simply experiment with colourful carpet tiling and floating floors to achieve a modern and stylish look. After all, 9-5s needn’t be boring. Who wants to be cramped up next to someone who chews loudly or hammers their keyboard at 70 miles per hour? Create space (or at least the illusion of space) between desks and work stations using raised floors for different areas, separation screens and larger desks so you feel you have the space to create… or even just think. Sitting, hunched over, tapping away at your laptop or computer for eight hours a day is not ideal either, so introduce standing desks, collaborative work stations and interesting ‘break out zones’ where employees can head to when they need a little movement. There’s a reason why breaks during the working day are encouraged, if not mandatory, so why not create playful spaces your employees can relax, get to know each other and even do their best thinking in? Lots of creatives say their best ideas come to them when their mind is distracted i.e. when they are hanging out with friends or having fun – so create somewhere for them to do just that within their working day and watch their productivity sky rocket. Think ping pong tables, bean bags or retro game machines to start. Everybody needs the time and space to reflect on things every once in a while. In fact, it is only natural for the human brain to want to tackle a problem by taking a moment of quiet to try and solve it, so having areas in your office space that allow for such thinking will be conducive to your employees’ performance. Think less fuss and more bright whites and bare walls in these areas in order to limit distraction and free the mind. 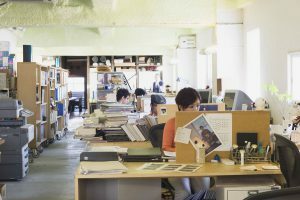 Of course, not all of these types of space will appeal to every type of business, but consider incorporating at least some of these aspects into your workspace. Are badly designed office environments stifling innovation?